ex-Lochita, ex-Anna, ex-Evelyn B., ex-Elise, ex-Industria, ex-Nils, ex-Winnie, built 1889, 1870 gross tons, steamer. 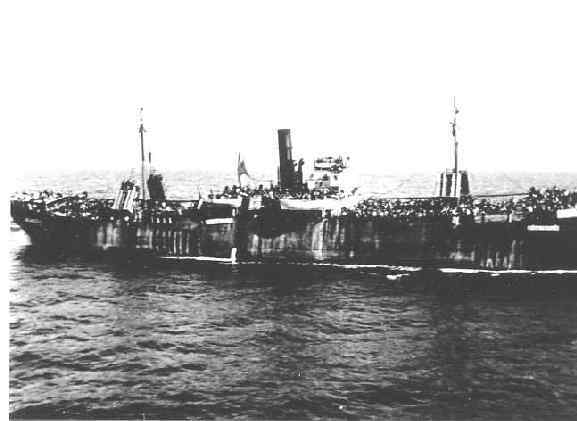 This ship carried the largest number to date, picking up the 600 survivors of the HaKedosha (No. 129). 11 babies born during the voyage. Captured without resistance by destroyers Haydon and Brissenden and minesweepers Octavia and Espiegle. But at Haifa efforts to transship the refugees to deportation ships were met with much resistance and two refugees were killed and 46 injured. The refugees were taken to Cyprus on the Empire Heywood, Empire Rival, and Ocean Vigour.